There are few forces in this world as powerful as hometown pride. And that is doubly true when you factor in the strength of hometown pride around food (Brooklyn and hot dogs, Kansas City and ribs, Chicago and... something that allegedly qualifies as "pizza", etc.). 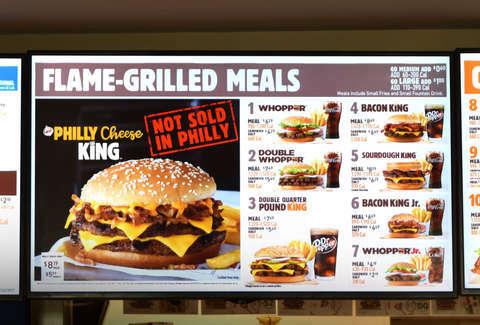 So, you have to hand it to one particular Burger King in Philadelphia for standing up to the chain by refusing to serve its newest burger, a twist on the iconic Philly cheesesteak dubbed the Philly Cheese King. Although the new burger, which is essentially two beef patties topped with caramelized onions and American cheese, received "taste test approvals from Philadelphians" per an official BK press release, the outpost at 15 S. 8th Street in the City of Brotherly Love will not be serving it. That is, until their protestation is "otherwise overturned by the Burger King brand," the company said. Surprisingly, there haven't been any reports of locations refusing to service the new nightmare-inducing sandwiches with bright green buns. It's not clear what exactly this particular location's beef (sorry) with the new item is, though it's possible they were simply irked by the questionable claim from BK that it concocted this fresh menu offering after "finding the fundamental flaw in the traditional Philly Cheesesteak" (which they apparently thought was its lack of flame-grilled beef?). In any case, if you're in the Philly area and feel compelled to introduce your taste buds to the Philly Cheese King, it's available in other participating restaurants there (and nationwide) for $5.99. Or, you know, you could just stick to the classic.